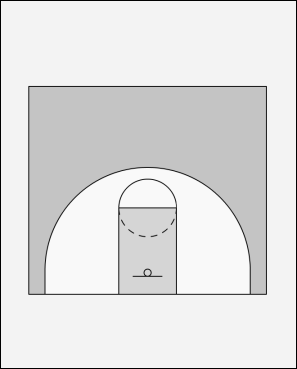 This a screen the screener play used to get a three point shot. Here it shown coming off of the secondary break. 1 dribbles towards the wing. 2 sets a screen in the lane for 3. 4 starts up the lane to the high post. 5 is trailing the play. 4 and 5 screen and then squeeze the defender as 2 goes in-between 4 and 5. 1 hits 2 for the three point shot. 4 and 5 go to the boards. If you didn't need the three, 1 could hit 3 posting up on the block.